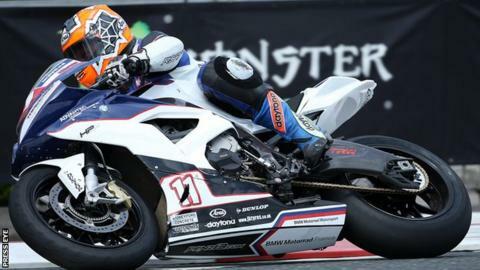 Northern Ireland motorcyclist Stephen Thompson has lost an arm as a result of injuries sustained in an accident at the North West 200 road races in May. The Crumlin rider underwent surgery to have the arm amputated this week. A statement released by Thompson's family explained that trauma suffered as a result of the crash had been causing major problems since the crash. "The forearm was suffering from muscle wastage and other problems with blood supply," the statement explained. "The surgeons explained to us that it was infected and if they didn't act soon it could be a worse situation than we were in. "Stephen had to make a life-changing decision either to lose the lower part of his arm or we could lose him. "Stephen made this decision on Sunday after speaking to the surgeons and the operation was scheduled in. Stephen has come through the surgery well and today is the start of the road to recovery. "Thank you for all your continued support and prayers it means a lot to us all, especially to Stephen." Thompson, 39, sustained a collapsed lung and bleeding on the brain as well as well as leg, arm and hand fractures in the crash on 16 May. A fund has been set up which aims to raise money to help aid Thompson's treatment. Spectator Violet McAfee sustained head and leg injuries in the crash but later told the BBC that was was "confident" of making a good recovery. Liechtenstein rider Horst Saiger sustained a broken arm in the crash while Englishman Dean Harrison escaped injury.